Some three months later, the Branch issued the first Federal aircraft mechanic license. The Aeronautics Branch of the Department of Commerce began pilot certification with this license, issued on April 6, 1927. The recipient was the chief of the Branch, William P. MacCracken, Jr. Orville Wright, who was no longer an active flier, had declined the honor.) 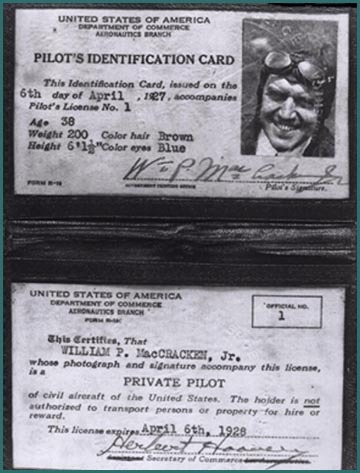 MacCracken's license was the first issued to a pilot by a civilian agency of the Federal government. Some three months later, the Branch issued the first Federal aircraft mechanic license. Equally important for safety was the establishment of a system of certification for aircraft. On March 29, 1927, the Aeronautics Branch issued the first airworthiness type certificate to the Buhl Airster CA-3, a three-place open biplane. 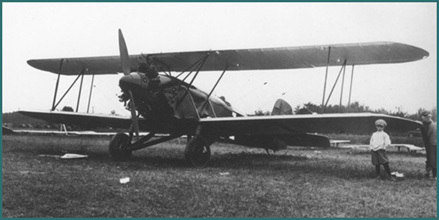 The Airster is shown below in a 1926 photograph. A student pilot certificate does not list category or class ratings, but is instead endorsed by a flight instructor to confer privileges in specific makes and models of aircraft. A type rating is required in a specific make and model of aircraft if the aircraft weighs more than 12,500 lb (5,700 kg) at takeoff or is powered by one or more turbojet engines. The Boeing 747, Beechcraft Super King Air 350, and the Hawker Hunter are examples of aircraft that require type ratings. A pilot can separately add an instrument rating to a Private or Commercial certificate. An Airline Transport Pilot implicitly holds an instrument rating; one does not appear on an ATP certificate. Instrument ratings are issued discretely for Airplane and Powered Lift categories and the Helicopter class. Glider and airship pilots may operate under Instrument Flight Rules under certain circumstances as well. An individual may hold only one pilot certificate at one time; that certificate may authorize multiple privilege levels distinguished by aircraft category, class or type. For example, an Airline Transport Pilot certificate holder may be permitted to exercise ATP privileges when flying multi-engine land airplanes, but only Commercial Pilot privileges when flying single-engine land airplanes and gliders. FAA may impose limitations on an pilot certificate if, during training or the practical test, the pilot does not demonstrate all skills necessary to exercise all privileges of a privilege level, category, class or type rating. For example, a holder of a DC-3 type rating who does not demonstrate instrument flying skills during the practical test would be assigned a limitation reading, "DC-3 (VFR Only)". To obtain a certificate or add a rating, a pilot usually has to undergo a course of training with a certificated instructor, accumulate and log specific aeronautical experience, and pass a three-part examination: a knowledge test (a computerized multiple-choice test, typically called the "written test"), an oral test and a practical test carried out by either an FAA inspector or a Designated Pilot Examiner. Another form of authorization is an endorsement from a flight instructor that establishes that the certificate holder has received training in specific skill areas that do not warrant a full test, such as the ability to fly a tailwheel-equipped, high-performance, complex, or pressurized airplane. Pilot certificates other than student pilot certificates do not expire, although they may be suspended or revoked by the FAA. However, a pilot must maintain currency — recent flight experience that is relevant to the flight being undertaken. To remain current, every pilot has to undergo a flight review with an instructor every 24 calendar months (unless he gains a new pilot certificate or rating in that time or satisfies the flight review requirement using an alternate approved means), and, for most types of certificate, undergo a medical examination at intervals ranging from six months to five years, depending on the pilot's age and desired flight privileges. Other currency requirements apply to the carriage of passengers or to flight under instrument flight rules (IFR). A medical certificate is not necessary to fly a glider or balloon, or to fly a Light-sport Aircraft. An ultra light aircraft can be piloted without a pilot certificate or a medical certificate. In addition to pilot certificates, the FAA issues separate airman certificates for Flight Engineers, Flight Instructors, Ground Instructors, Aircraft Dispatchers, Mechanics, Repairmen, Parachute Riggers, Control Tower Operators, Flight Navigators and Flight Attendants. Most pilots in the U.S. undergo flight training as private individuals with a flight instructor, who may be employed by a flight school. Those who have decided on aviation as a career often begin with an undergraduate aviation-based education. Some pilots are trained in the armed forces, and are issued with civilian certificates based on their military record. Others are trained directly by airlines. The pilot may choose to be trained under Part 61 or Part 141 of the FARs. Part 141 requires that a certified flight school provide an approved, structured course of training, which includes a specified number of hours of ground training (for example, 35 hours for Private Pilot in an airplane). Part 61 sets out a list of knowledge and experience requirements, and is more suitable for students who cannot commit to a structured plan, or for training from freelance instructors. Most pilot certificates and ratings require the applicant to pass a knowledge test, also called the "written test". The knowledge test results are valid for a period of 2 years, and are usually a prerequisite for practical tests. Resources available to prepare for the knowledge test may be obtained from pilot supply stores or vendors. The exceptions where a knowledge exam is not required for a practical test are for some add-on ratings after the initial license, such as a powered aircraft pilot adding an additional category rating at the same license level. In order to take knowledge tests for all pilot certificates and ratings, the applicant must have a sign-off from a ground or flight instructor. These are usually given by an instructor who has taught a ground school course, provided ground instruction or reviewed the applicant's self-study preparations. All pilot certificates and ratings require a practical test, usually called a "check ride". For each practical test, the FAA has published a Practical Test Standards document which is expected to be used by the applicant to prepare, by the flight instructor to teach and evaluate readiness for the exam, and by the examiner to conduct the exam. A practical test is administered by an FAA Inspector or an FAA Designated Pilot Examiner. The check-ride is divided into two parts: the oral exam followed by a flight test in the aircraft. Upon successful completion of the practical test, the examiner will issue a temporary airman certificate with the new license or rating. In order to take practical tests for all pilot certificates and ratings (except Airline Transport Pilot), the applicant must have proper logbook endorsements from their flight instructor. Independent training followed by becoming a part- or full-time instructor. A college-level aviation program, in which a bachelor's degree (commonly in Aviation Science or a related field) is conferred upon the completion of both flight and classroom coursework. Frequently, upperclassmen are employed as flight instructors for other students. Banner towing, traffic reporting, sky diver pilot, fire patrol, pipeline patrol, aerial photography, glider towing, or other "odd jobs" in aviation, most of which are fairly low-paying and require only the legal minimum experience. The FAA offers a progression of pilot certificates, each with its own set of privileges and limitations. All pilots must be at least 17 years old (16 for a student, or a glider or balloon pilot), and be able to read, write, speak, and understand English. A student pilot certificate is issued by an aviation medical examiner (AME) at the time of the student’s first medical examination; for operations not requiring a medical certificate, a student pilot certificate can be issued by an FAA inspector or an FAA-designated pilot examiner. The student pilot certificate is only required when exercising solo flight privileges. The student certificate is valid until the last day of the month, 24 months after it was issued. Once a student has accrued sufficient training and experience, a CFI can endorse the student's certificate to authorize limited solo flight in a specific type (make and model) of aircraft. A student pilot may not carry passengers, fly in furtherance of a business, or operate an aircraft outside of the various endorsements provided by the flight instructor. Read, speak, write, and understand the English language. Before a trainee can start the solo phase of flight training, a Student Sport Pilot Certificate must be issued by the Federal Aviation Administration (FAA). These may be obtained from an FAA Flight Standards District Office or FAA Designated Pilot Examiner. Fly one solo cross-country flight over a total distance of 75 or more nautical miles to two different destinations to a full-stop landing. At least one leg of this cross-country must be over a total distance of at least 25 nautical miles (46 km). The recreational pilot certificate requires less training and offers fewer privileges than the private certificate. It was originally created for flying small single-engine planes. Its main advantage has been that it permits cheaper training between the sport and private pilot certificates. The private pilot certificate is the certificate held by the majority of active pilots. It allows command of any aircraft (subject to appropriate ratings) for any non-commercial purpose, and gives almost unlimited authority to fly under visual flight rules (VFR). Passengers may be carried and flight in furtherance of a business is permitted; however, a private pilot may not be compensated in any way for services as a pilot, although passengers can pay a pro rata share of flight expenses, such as fuel or rental costs. Private pilots may also operate charity flights, subject to certain restrictions, and may participate in similar activities, such as Angel Flight and flights for organizations such as Pilots-n-Paws, CAP (Civil Air Patrol), and ARF (animal rescue flights). Three solo takeoffs and landings to a full stop at an airport with an operating control tower. A commercial pilot may be compensated for flying. Training for the certificate focuses on a better understanding of aircraft systems and a higher standard of airmanship. The commercial certificate itself does not allow a pilot to fly in instrument meteorological conditions. For aircraft categories where an instrument rating is available, commercial pilots without an instrument rating are restricted to daytime flight within 50 nautical miles (93 km) when flying for hire. By itself, this certificate does not permit the pilot to set up an operation that carries members of the public for hire; such operations are governed by other regulations. Otherwise, a commercial pilot can be paid for certain types of operation, such as banner towing, agricultural applications, and photography, and can be paid for instructing if he holds a flight instructor certificate. To fly for hire, the pilot must hold a second class medical certificate, which is valid for one year. Often, the commercial certificate will reduce the pilot’s insurance premiums, as it is evidence of training to a higher safety standard. An airline transport pilot (commonly called an "ATP" or "ATPL") is tested to the highest level of piloting ability. The certificate is a prerequisite for acting as a pilot-in-command in scheduled airline operations. The minimum pilot experience is 1500 hours of flight time and 500 hours of cross-country flight time. Other requirements include being 23 years of age, instrument rating, being able to read, write, speak, and understand the English language, a rigorous written examination, and being of good moral character. An active pilot is defined as one who holds both a pilot certificate and a valid medical certificate, so this value omits pilots who do not have a medical certificate (particularly troublesom are glider, balloon, and sport pilots, these pilots do not require a medical certificate). A flight instructor certificate authorizes the holder to give training and endorsement for a certificate, and perform a flight review. An instrument rating is required to fly under instrument flight rules. Instrument ratings are issued for a specific category of aircraft; a pilot certified to fly an airplane under IFR has an Instrument Airplane rating. A multi-engine rating is required to fly an airplane with more than one engine. It is the most common example of a class rating. A multi-engine instructor rating authorizes a certified flight instructor to give training and endorsement for a multi-engine rating. United States military pilots are issued an Aviator Badge upon completion of flight training and issuance of a pilot's certificate. Badges for crew or ground positions are also issued to qualified applicants.